-Read the excerpt below from Yarden Frankl's HonestReporting.com post. HonestReporting has documented how the vast majority of articles and editorials in the New York Times depict Israel in an unfavorable and often erroneous way. Yet the NY Times might argue that its coverage is negative because Israel’s actions and policies warrant such coverage. In other words, it would claim to be simply reporting the news rather than presenting a biased viewpoint. HonestReporting did a comparison of the NY Times’ coverage to that of the Washington Post and Los Angeles Times. If coverage of Israel by all three papers was close, then perhaps the NY Times’ argument would have merit. On the other hand, if the NY Times presented a different picture of Israel than the other papers, it would add to the evidence that it reports from a biased, anti-Israel perspective. How else could one explain that the NY Times covers Israel differently than other sources reporting on the same events? Some of the bias is very subtle, but when readers absorb news that is written in a biased way, it can’t help but impact the way they understand events. Just one example paints the picture. In looking at “fairness” (what percentage of the articles concerned subjects that reflected negatively on Israel), only one quarter of the Washington Post articles and one third of those in the LA Times reflected negatively on Israel. An overwhelming 67% of articles in the New York Times did so. Other metrics measured showed similar discrepancies. FAIRNESS: Percentage of articles that expressed criticism of Israel or depicted Israeli actions in a negative light. In any media outlet’s reports on Israel, there will be some negative and critical stories. That’s to be expected since Israel, like all Western countries, is not perfect. However, there is no reason why negative stories should overwhelm all other coverage. They don’t in the LA Times or the Washington Post. Yet reporting on the same facts and the same events, the New York Times finds a way to report negatively on Israel two-thirds of the time. For example, on January 10, the New York Times published “In Blow to Peace Efforts, Israel Publishes Plans for New Housing in Settlements.” Not only is the Israeli announcement labeled a “Blow to Peace Efforts” in the headline, but the article opens by referring to “a move the chief Palestinian negotiator condemned as a “slap” to Secretary of State John Kerry’s intense push for a Middle East peace deal.” Before the reader can actually get to the details, the Israeli announcement has been qualified in both the headline and the first paragraph. The same day, the LA Times published an article on the same issue with the headline simply stating that “Israel announces more settlement construction.” The article opens and describes how the move drew criticism but was expected. The Washington Post had a similarly neutral headline. The Post did mention the “slap” reference, but only in the fifth paragraph. It is only the New York Times that elevates the quotation by Saeb Erekat to the first description of the Israeli policy. The way the NY Times reported on the Israeli announcement was far from an objective survey of the facts – it condemned Israel by using an opinion on settlements as a factual analysis. Then there is the issue of opinion pieces. In the New York Times, 88% of the op-eds were critical of Israel. Most of the opinion pieces in the LA Times and Washington Post were either neutral or positive. Examples of opinion pieces critical of Israel or Israeli actions or leaders include “Israel Needs to Learn Some Manners,” “How Israel is Losing the Propaganda War,” and “The Third Intifada” (justifying the boycott Israel movement.) The NY Times employs regular columnists like Tom Friedman who has shown a history of one-sided criticism of Israel and support for the Palestinian Authority. 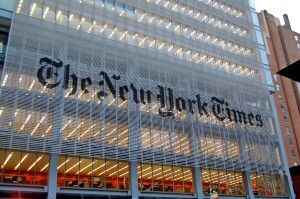 The way the New York Times covers Israel displays a clear bias. HonestReporting has analyzed the Times’ coverage on its own merits and compared to other leading American newspapers that are not known for being pro-Israel. In all the HonestReporting studies going back over many years, the Times has shown a consistent bias, reporting negatively on Israel and Israeli actions. Negative stories far overwhelm positive ones, important context is lacking, misleading terminology is used, and quotations showing subjective bias influence readers to have a poor impression of Israel. Ask the NY Times Public Editor, Margaret Sullivan why the paper’s coverage is so biased against Israel when compared with other reputable news sources. E-mail her at public@nytimes.com. 1. In Yarden Frankl’s HonestReporting.com report, he identifies bias of “Fairness.” Which type of bias in the StudentNewsDaily “Types of Media Bias” page also explains the examples he gives in his report? 2. In his analysis, Mr. Frankl writes: “There is no reason why negative stories should overwhelm all other coverage. They don’t in the LA Times or the Washington Post. Yet reporting on the same facts and the same events, the New York Times finds a way to report negatively on Israel two-thirds of the time.” What do you think of his assertion and explanation? 1. Yarden Frankl’s HonestReporting.com report demonstrates examples of bias by SPIN: spin involves tone – it’s a reporter’s subjective comments about objective facts; makes one side’s ideological perspective look better than another.